By Ozan Beran Akturan / June 23, 2018, 10 p.m. 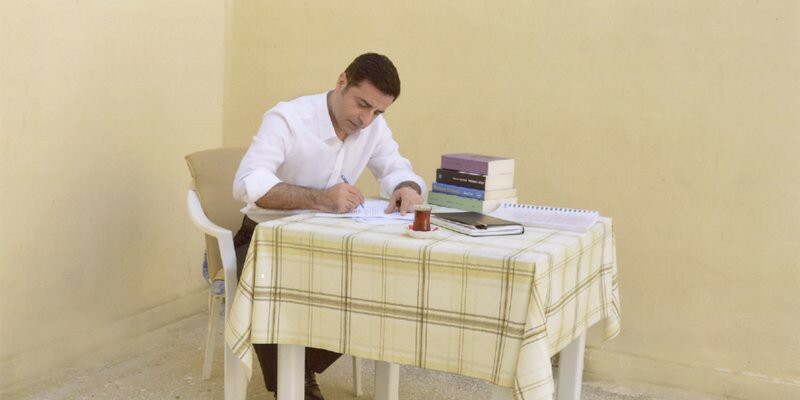 This photo features Selahattin Demirtaş writing a letter from his prison cell. The photo was made public by the HDP. Turkish President Recep Tayyip Erdoğan and his fifteen years in power will be tested at the polls this Sunday. Erdoğan is running for the presidency under the new presidential democracy established as a result of a still-doubted referendum. He is highly likely to be the self-secured winner, given the authoritarian power he is enjoying after his crackdown on the opposition following a failed coup in 2016. The explicit target of his implicit nationalist and absolutist whims, Kurds stand as the major checkpoint in Turkey’s next episode of democracy. As the presidential front runners still equivocating the Kurdish question, the country is burning its democratic bridges for a political resolution of the decades-long issue. The combined Turkish parliamentary and presidential snap elections on June 24, which were originally scheduled for November 2019, will be the first election since July 2016’s failed coup attempt. Though Erdoğan claims the early polls are to bolster stability in Turkey’s fight against terrorism, many speculate that soaring inflation and the rapid devaluation of the Turkish lira are the true triggers of the premature ballot, which was announced only in mid-April, giving the opposition less than two months to campaign. Regardless of the motivation, the elections are only to confirm, not to challenge, the new executive presidency that was introduced after the razor-thin victory of the constitutional referendum in April 2017, which abolished Turkey’s parliamentary democracy and gave Erdoğan the right, among others, to issue executive decrees and appoint more than a quarter of the members of the Board of Judges and Prosecutors. Now, with the six hundred seats of the Turkish parliament secondary to the singular seat of the president in terms of executive powers, critics fear that the early presidential elections will further serve to reinforce Erdoğan’s one-man rule. Many have claimed that the new presidential system is incompatible with Turkish democracy’s urgent need for transparency and supremacy of law as long as the uncontested control centralized in the president opens the country up to power abuse. Erdoğan recently exemplified this control by legally giving himself unbounded authority in extending the state of emergency introduced after the attempted coup, which has bestowed unchecked powers to the government. These emergency measures have enabled Erdoğan to enact laws that bypass parliament and that gave the police broader power of arrest. They have resulted in the suppression of any form of dissent, putting nearly a hundred journalists in prison (more than any other country in the world) and shutting down over 130 media outlets, with the rest remaining silently under state control. Along with this excruciating censorship on freedom of expression, the free and fair channels of democracy were further clogged by the muted constitutional court and sweeping restrictions imposed on freedom of assembly on the eve of elections, which disproportionately affected the pro-Kurdish People’s Democratic Party (HDP). Even before these omnipotent emergency laws were put in place, Kurdish politicians had already been anxious about their future, unsure of whether they could feel protected by law as they exercise their political rights, as they had been stripped of their parliamentary immunity in May 2016. Time proved their concerns right with the post-coup arrest of nine HDP MPs and almost five thousand HDP officials. Thus, the vacuum of democracy that is kept intact by the zestful state of emergency rhetoric has only agitated the already careworn Kurdish politics as its pro-resolution struggle has been relegated to the status of felony and terrorism. Therefore, perhaps much to Kurds’ chagrin, just hours after the announcement of the snap elections, Erdoğan’s ruling Justice and Development Party (AKP) hastily extended the state of emergency for another three months. With this seventh extension, the state of emergency will have been in place for two years by the next month, a clear indication of Erdoğan’s post-referendum desire to maintain his authoritarian control over Turkey, which is only procedurally democratic under the twisted notion of democracy Erdoğan has legitimized for his supporting majority. What will it take to redeem the dissolving Turkish democracy? Though abolishment of the state of emergency and return to normal rule of law is a necessary step for that end, it would not be sufficient unless Turkish politics assume a welcoming and attentive attitude towards democratic representation of its minorities. Thus, the future of the presidential candidate Selahattin Demirtaş, the previous co-chair of the HDP who was arrested during the post-coup crackdown and has been in prison for the last nineteen months, will be perhaps the most indicative item in Tukey's test of democracy following the elections. Accused of spreading terrorist propaganda and facing up to 142 years behind bars, Demirtaş previously secured 10 percent of the vote against Erdoğan in the 2014 presidential election with his commitment to solve the Kurdish issue in parliament, promising to silence the guns in the mountains. Despite their willingness to resolve the dispute politically, Kurds—with their jailed candidate and exclusion from the opposition alliance—feel alone and alienated by the juridical system and Ankara lobbies. Though mostly symbolic, Demirtaş’ candidacy is hoped to divert most of the Kurdish votes away from Erdoğan, who would otherwise be the choice of religious and conservative Kurds. However, his imprisonment de-effectivizes this and may not produce the hoped-for effects. In the parliamentary leg of the elections, however, Kurdish votes have more practical significance. Barred from the Turkish parliament for many years because of a 10 percent electoral threshold, Kurdish political parties recently actualized their oppositional potential for the first time by denying Erdoğan’s AKP the supermajority when they gained 13 percent of the votes in 2015 general elections. Thus, on June 24, if the HDP again makes the 10 percent parliamentary cut, the AKP might not secure the simple majority of 301 seats. This would act as a crucial check on Erdoğan’s law-making power if he is re-elected president since the Turkish parliament still remains the legislative powerhouse, able to revoke presidential decrees by simple majority. In the case of a presidential run-off round between Erdoğan and the opposition front-runner Muharrem İnce, Kurdish votes could gain further importance. İnce himself adopts a more conciliatory tone in his ethnic rhetoric than his Republican People’s Party (CHP), the secular left-wing main opposition. However, he was supportive of the Turkish military offensive in Afrin which ended in late March and had the goal of retarding the autonomy of Kurds in northern Syria, ultimately causing hundreds of casualties and diluting the Kurdish demographics of the region after the deliberate relocation of Damascus locals into Afrin by Turkish forces. İnce also supported recent military attacks against the Kurdish guerillas in Iraq, which are affiliated with the Kurdistan Workers’ Party (PKK) (a militant insurgency group against the Turkish state). These attacks intensified in the wake of Iraqi Kurdistan’s independence referendum on September 25, 2017. Thus, in the event of his presidency, it is unlikely that İnce would address the PKK as a serious negotiation partner to revive the ceasefire between the PKK and state that broke in 2015 summer. As has been seen, the presidential frontrunners have neither an explicit intention nor any ambitious agenda to pursue a sustainable and comprehensive solution to the Kurdish question in a way that would not demonize or radicalize the Kurdish demands for equal and dignified respect for their belated ethnicity rights in Turkey, Syrian Rojava and Iraqi Kurdistan. It is no surprise that the future exoneration of Demirtaş, which is unlikely in the short term as long as authorities temporize his trial, would hence be the direct indicator of Turkish politics’ preparedness to stitch its gaping wound in democracy and human rights. Not only at the ballot, but also in every fundamental area of life, the raging breath of draconian authority blows close to the Kurds. In the last three months, dozens of Kurdish journalists have been arrested and nearly eight hundred people protesting the Turkish military intervention in Afrin on their social media accounts have been detained. For example, Zehra Doğan, a Kurdish artist who painted a scene from last September’s military curfew in the Kurdish towns of Nusaybin (during which the Turkish army used heavy artillery against Kurdish civilians) depicting the tanks of the Turkish army as scorpions, has been sentenced to nearly three years in prison. Furthermore, with more than 11,000 Kurdish teachers suspended over feeble terrorism charges, dozens of predominantly Kurdish cities’ mayors dismissed and replaced by state appointees, Kurdish culture and art centres and civil-society organizations banned and sued, and over twenty Kurdish media outlets, including children’s channels, restrained due to their alleged links to terrorism, the 15 million strong Kurdish population of Turkey is in an indefinite stage of imprisonment too, as far as its civil rights concerned. Given these facts, even though the Kurdish politics would be emancipated if Demirtaş is released, the punitive and undemocratic status quo would not be altered as long as Kurdish culture is kept in an invisible jail and demarcated as off limits. The situation will further deteriorate for Kurds in Turkey should Erdoğan secure another term to exercise his autocratic rule, the implicit motives of which have taken their toll on the prospect for a peaceful Turkish-Kurdish solution. However, in the long run, whether or not the country could recover its suspected democracy (which is currently listed as a “hybrid regime” of democracy and authoritarianism) highly depends on whether the public is ready to undertake and internalize the deep ideological changes needed to address the complex stakes of the Kurdish dispute by breaking free of the traditional chauvinist dogmas intrinsic to the country’s politics. This is Turkey’s litmus test for democracy. Whatever the result, the upcoming elections will prove to be a pyrrhic victory for the nation with grim social costs if the urgency of the Kurdish question left unrealized. Ozan Beran Akturan is a Contributing Writer for the Gate. Opinions expressed in this article are not necessarily reflective of the Gate.